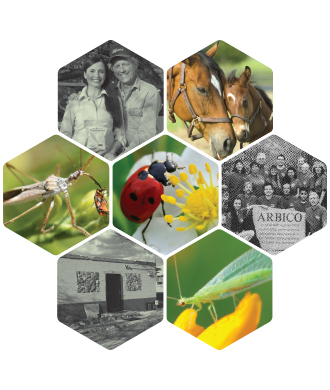 Fly Control Testimonial: Liz Sundt Adkins of Santa Paula Stables discusses her success using ARBICO Organics' Solar Fly Trap and Fly Eliminators. She explains how pleased she is with the her fly control and how easy they are to use! Santa Paula Stables was established in 1977 and is located on 20 acres near Tucson, Arizona. This beautiful facility is designed to meet the needs of hunter jumpers, dressage and pleasure riders. Special thanks to Hector Gonzalez for his video production efforts. Why Use Fly Eliminators? Are you a horse or livestock owner with a fly problem? Looking for a natural way to rid of your flies? See how simple using Fly Eliminators is. Chemical-free Fly Control has never been easier! How To Successfully Release Fly Eliminators: Fly Eliminators, a type of fly parasite, are used by horse and livestock owners to kill flies before they hatch into annoying, disease-carrying adults. This video shows how to release Fly Eliminators in a stable setting. How To Set Up & Use Your Solar Fly Trap: Thes made-to-last, rust-free, Solar Fly Trap from ARBICO Organics goes anywhere to reduce existing fly populations, fly blooms and migrant flies. It's used by horse owners, breeding and training facilities, kennels, dairies, poultry and swine facilities, feedlots and other places where flies are a problem. A yeast-based bait is mixed with water and poured into the container at the bottom of the trap. Flies are lured into the trap and dehydrate from exposure to the sun. When it begins to fill up with flies, just empty the trap, hose out and reset with new bait. What Are Beneficial Nematodes & How Do They Work? Beneficial Nematodes are live microscopic organisms that occur naturally in soil throughout the world and parasitize a wide range of soil-dwelling insect pests. Check out the video below for up-close images of Beneficial Nematodes in action! How To Mix & Apply Beneficial Nematodes: ARBICO Organics' Beneficial Nematodes are live microscopic organisms that occur naturally in soil throughout the world. They are parasitic to insect pests that typically have a larval or pupal life stage in the soil; however, they have been known to also parasitize above ground stages of some insects. Applying Beneficial Nematodes For Fleas In A Residential Setting: Beneficial Nematodes are the first and best line of defense against fleas and ticks. These microscopic insect parasites locate flea and tick larvae in the soil and enter the prey infecting them with toxic bacteria killing them in 24 to 48 hours. Why Use Beneficial Nematodes? Beneficial Nematodes are a natural and easy way to get rid of numerous pests like grubs, fungus gnats, fleas and ticks and other pests that develop in the soil. Safe for use around pets and animals! Why Use Green Lacewing In Your Garden? Green Lacewing are ravenous predators of aphids, whiteflies and a long list of other soft-bodied pest insects. Lacewing larvae feed for 2-3 weeks as they get ready to pupate. As adults, they aid in pollination while laying more eggs around the area. What Do Assassin Bugs Do? Assassin Bugs, Zelus renardii are hardworking ambush predators that are an excellent addition to any growing area – large or small. They feast on a variety of small to medium sized pests and stay put in order to help knock down infestations. Control Mosquitos Using Bti & Other Chemcial-Free Remedies: Bacillus thuringiensis israelensis has been used for mosquito control for decades and continues to prove effective today. Watch Sheri speak about the benefits of Bti-based mosquito control below. Setting Up The Insect-A-Peel Trap: The revolutionary Insect-A-Peel Trap uses modern science to trap everything from Flies and Fungus Gnats to Aphids, Whiteflies and Thrips. Its bright yellow color and three dimensional, tubular design attracts pest insects from all directions during daylight hours.